Here is a brief excerpt from Elder Morgan’s letter home. In my last email, I mentioned a man named Igor whom we met on the street while street boarding. 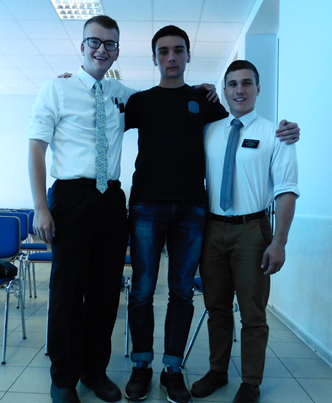 We saw him for the last time in Moldova a few days ago. We had an amazing lesson with him, and then found out that in 2 days he would be flying to England to live there permanently. He told Elder Findlay and I that he prayed to God the night before, and he heard Heavenly Father’s voice. He described it as if it were thunderous. He told us that he heard “These two guys will teach you what you need to know”. That is so amazing! Igor with Elder Morgan and his companion.